A transgender person tells the story of his transition. At an early age, Kergil, an activist for the transgender community, began wearing his older brother's hand-me-down clothes, cutting his hair short, and playing games more readily associated with boys than girls. His birth name was Katherine, but that didn't feel quite right to him. It was only when he reached his teens that he began to learn about transgender people and suddenly recognized he was also a man born into a woman's body. 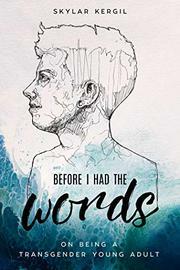 In youthful, enthusiastic prose, the author tells the story of how he shifted to thinking of himself as a boy and the fears, anxieties, and doubt he experienced as he gradually told his closest friends and family members of the change he was going through. Some people accepted him readily with warmth and love, while others had difficulties with this shift. Kergil recalls the harassment he endured from a wide variety of people, but despite the physical and emotional pain, he continued to push toward a goal of full transition. He explains the exploration stages he went through with various girlfriends and the process of physical transition, beginning with hormone treatments, then top surgery, and beyond. Kergil's straightforward account gives readers a behind-the-scenes look at the mental, emotional, and physical aspects of being a transgender person. He shares how difficult the road has been toward acceptance and some of the tactics and words that have helped him. Although the writing tends toward immature, Kergil's story should help many who are in the beginning stages of gender identity exploration understand they are not alone as well as aid those who want to be more empathetic to the transgender community. An unremarkable but honest account of the young life of a transgender person.